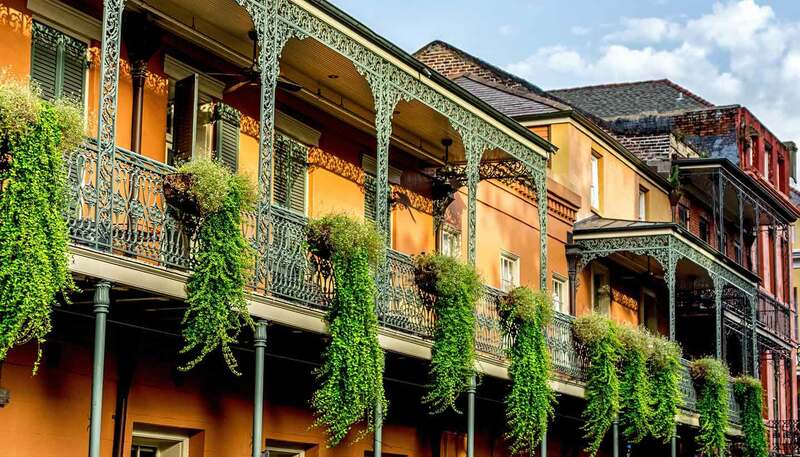 Explore New Orleans' revitalised Arts District, filled with art galleries, restaurants, shops and world-class museums. Visit the Baton Rouge Zoo (www.brzoo.org) with its 57 hectares (140 acres) of walk-through areas and forest settings for over 400 animals. Take a mysterious Bayou swamp tour, led by Cajun storytellers. Sample the food, music and take the opportunity to go crawfish harvesting with the locals. Visit Bourbon Street for traditional jazz at its best in the heart of the French Quarter. Listen to New Orleans-style jazz played by veteran musicians in the legendary Preservation Hall, a bare bones music hall echoing the days of slaves making music along the Mississippi Delta. View the magnificent Capitol Building, in Baton Rouge, a limestone-clad 34-storey building with a viewing platform overlooking 11 hectares (27 acres) of formal gardens in the Capitol grounds. Look out for ducks, geese, alligators, nutria and muskrats on the Creole Nature Trail (www.creolenaturetrail.org) near Lake Charles. Soak up New Orleans' famous music. Old-line musicians play over meals, street musicians huddle in doorways at dusk and free concerts are offered weekly in the French Quarter. Louis Armstrong, Harry Connick Jr, Fats Domino and Jelly Roll Morton are all part of the city's rich musical heritage. Explore the Global Wildlife Center (www.globalwildlife.com). Visitors can enjoy horseback riding among the exotic animals that roam the 364-hectare (900-acre) park. Cruise through the swamps and bayous, past cypress trees hung with Spanish moss, looking for alligators and birdlife. Honey Island Swamp (www.honeyislandswamp.com) and Louisiana Swamp Tours (www.louisianaswamp.com) offer a selection of special cruises through the Louisiana swamps, including buffet and dinner cruises. Visit Houma (www.houmatourism.com), a bayou town surrounded by swampland. The town is known for its many swamp tours, where alligators, wading birds and myriad other forms of swamplife thrive. At the Louisiana Children's Museum (www.lcm.org), kids of all ages can pretend to star in their own TV show or shop in a recreated mini-mart. Place your bet at Louisiana Downs Thoroughbred Racetrack, across the Red River from Shreveport, in Bossier City. It is open for racing from late spring until the autumn. See exhibitions on Mardi Gras and jazz at the Louisiana State Museum (http://lsm.crt.state.la.us) on Jackson Square. Attend New Orleans' Mardi Gras (www.mardigrasneworleans.com) - the biggest party of the year. It rocks the whole city during the three weeks leading up to Ash Wednesday. Colourful parades, masquerade balls and street parties make the festival one of the loudest and liveliest celebrations in the world. Explore the Mississippi River on one-day cruises or longer on ferries or paddlewheel steamboats. Steamboat Natchez has harbour, dinner and jazz cruises (www.steamboatnatchez.com). Tour the Tabasco factory in New Iberia (www.cityofnewiberia.com), where the world-famous Tabasco sauce is made. The city offers tours of subtropical gardens, stately antebellum homes, rice mills and the hot sauce and pepper plant farms. View the collection of French works at the world-renowned New Orleans Museum of Art (www.noma.org). View one of the most important archaeological finds in the USA. The Poverty Point State Historic Site (www.nps.gov/popo) features an ancient Native American religious area dating from 1700BC. Stop by the RW Norton Museum (www.rwnaf.org). It features Old West artists Frederic Remington and Charles M Russell, and has one of the largest and most complete collections of Russell's bronze sculptures. Tour Rivertown USA (www.rivertownkenner.com), a 16-block historic district with family attractions, eight museums, fine arts gallery, repertory theatre and shops in a Victorian setting. Grab your rod for year-round fishing in the region known as 'Sportman's Paradise'. Its many forests and lakes offer opportunities for fishing, hunting, canoeing and hiking, and an annual fishing tournament takes place at Toledo Bend.